VDJMLpy is a Python module for working with the results of immune receptor sequence alignment in VDJML format. It is built as bindings to libVDJML, a C++ library. Analyze the junction sequence and look at the areas surrounding the junction (anchors on each end VJ, DJ, VD) Based on the analysis compute a read interval and declare it to be the junction. Return that interval as well as the sequence as a package via an array. 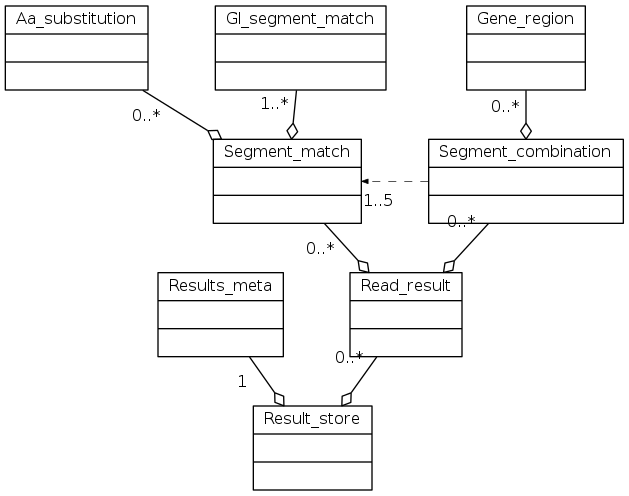 Testing of this code with real data (millions of reads) has shown that when intervals and sequences are returned that when the interval is used with the actual read that the returned sequences from here match the sequences retrieved from the read using the computed interval. © Copyright 2013-4, Mikhail K. Levin, Edward A. Salinas. Created using Sphinx 1.2.3.